Hyper-Threading works by duplicating certain sections of the processor – those that store the architectural state – but not duplicating the main execution resources. This allows a hyper-threading processor to appear as the usual “physical” processor and an extra “logical” processor to the firewall. 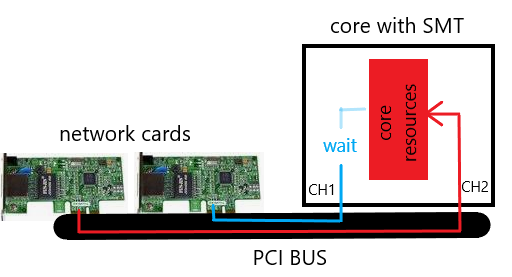 SMT can increase message rate for multi process applications by having more logical cores. This increases the latency of a single process due to lower frequency of a single logical core when hyper-threading is enabled. This means interrupt processing of the NICs will be slower, load will be higher and packet rate will decrease. I think that’s why Check Point doesn’t recommend SMT in pure firewall and VPN mode. From my point of view, it only accelerates software balades. Therefore I use it if necessary, if many blades are activated. I’d like to discuss that with Check Point. use hide NAT extensively -> Refer to sk88160 – Dynamic NAT port allocation feature to mitigate this limitation. For supported appliance refer to “Supported Appliances”. For example for “HP ProLitan DL360 Gen9” refert to SK Required steps before installing Gaia OS on HP ProLiant Gen9 servers. Installation of the hotfix from sk109772 – R77.30 NGTP, NGTX and HTTPS Inspection performance and memory consumption optimization. Enabling of SMT feature in ‘cpconfig‘ (refer to “Enable SMT” section). Requires enabling of SMT feature both in the BIOS (1) and in ‘cpconfig‘ (refer to “Enable SMT” section). 12600 Requires enabling of SMT feature both in the BIOS (1) and in ‘cpconfig‘ (refer to “Enable SMT” section). Requires enabling of SMT feature only in ‘cpconfig‘ (refer to “Enable SMT” section).